Immediately east of the Yokohama Bridge on the Shuto Expressway is the Tsurumi Tsubasa Bridge. We visited it while it was being built in 1992. It is a three span continuous steel cable-stayed bridge. To speed the construction, a non-moored barge was used to lift the superstructure segments into place for the first time in Japan. 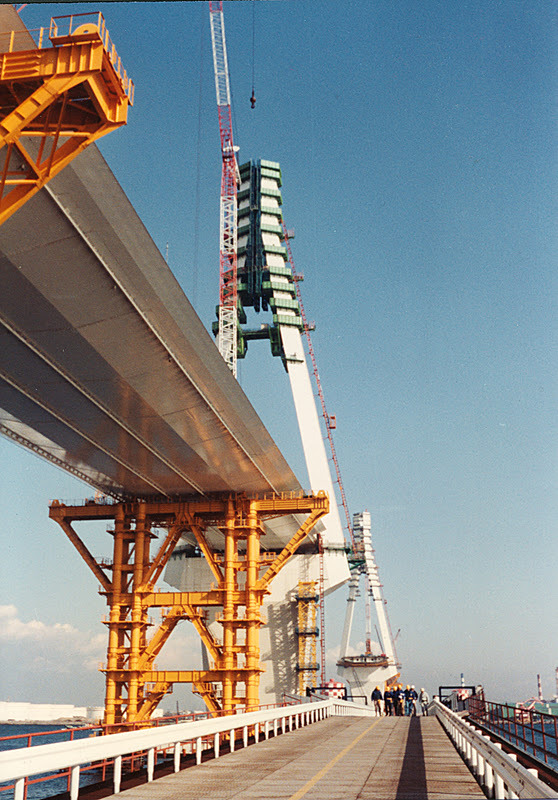 The bridge was carefully designed for wind and seismic loads. Wind testing was conducted with and without an adjacent structure that was planned to be built in the future. The edge of the structure has a special aerodynamic shape to reduce drag. An oil-damping system was used to control vibrations during earthquakes. We'll look at the completed bridge tomorrow. Tokyo Bay Bridges: Tsurumi Tsubasa Bridge (1) by Mark Yashinsky is licensed under a Creative Commons Attribution-NonCommercial-ShareAlike 3.0 United States License.